The most fundamental calculation in the COSYSMO model is the use of the Effort Equation to estimate the number of Person-Hours required to develop a project. Most of the other COSYSMO results, including the estimates for cost, effort per phase, and effort per activity, are derived from this quantity. To use COSYSMO to your best advantage, you should understand the assumptions and definitions behind the model. The Constructive Systems Engineering Model (COSYSMO) describes the model in detail, and indicates how the model was developed and validated. The dissertation is installed in the SystemStar folder on the Start | Programs menu with the name "The COSYSMO Model". The overall size for your project is derived from the counts you supply for each size driver (e.g. 50 requirements, 5 interfaces, 2 algorithms, 3 scenarios). The overall size is expressed in terms of equivalent requirements and is the fundamental input to the COSYSMO Effort Equation. 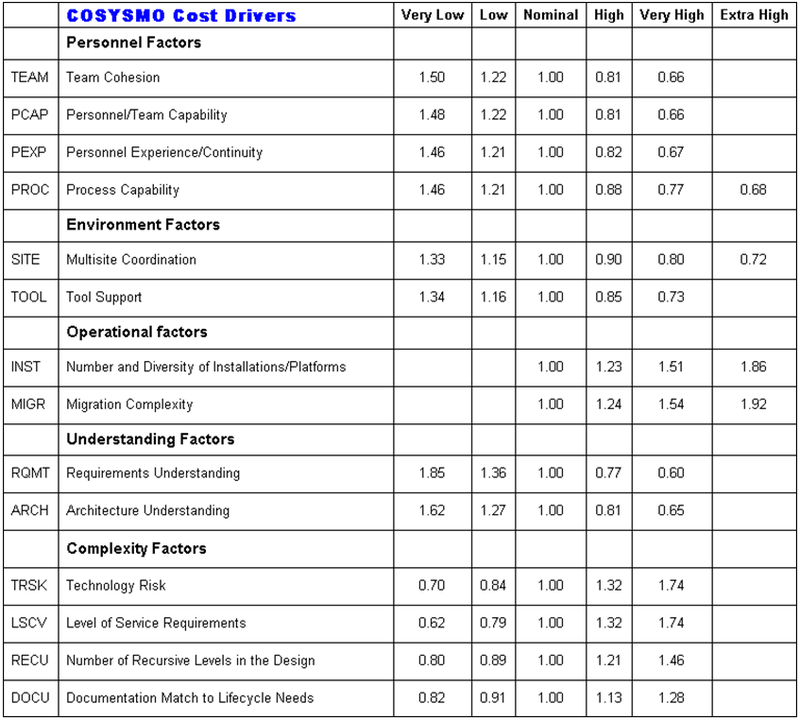 COSYSMO has 14 cost drivers - you assess your project, development environment, and team to set each cost driver. The cost drivers are multiplicative factors that determine the effort required to complete the systems engineering portion of your project. For example, if your team is the best you've ever worked with, you might set the Personnel/Team Capability Cost Driver (PCAP) cost driver to Very High. That rating corresponds to an effort multiplier of 0.66, meaning that your project will require only 66% of the systems engineering effort that a typical project would require. Each SystemStar model implements a different set of Cost Drivers and Equations. For example, if your project is rated Very High for PCAP (effort multiplier of 0.66), and Very High for Tool Support (effort multiplier of 0.73), and all of the other cost drivers are rated to be Nominal (effort multiplier of 1.00), the EAF is the product of 0.66 and 0.73. The Effort Equation presented above is the latest COSYSMO equation - it's a generic equation based on data from a group of aerospace corporations. Early experience indicates that this 'average' equation doesn't estimate very well for any specific organization. It's vital that you perform a 'local calibration' to determine the optimum Effort Equation for your company. "Calico for SystemStar", shipped with SystemStar, is the tool that calibrates the COSYSMO equation to your historical data.